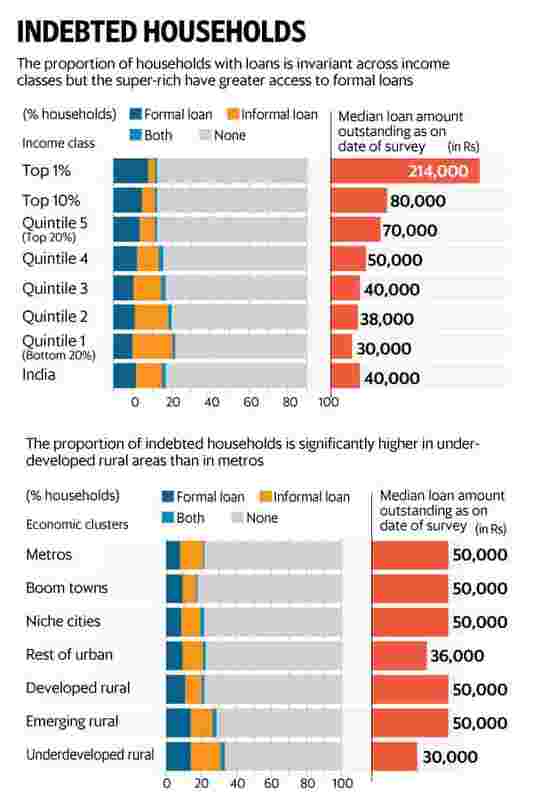 New Delhi: More than a quarter of Indian households are indebted, and a majority of them borrow from informal sources rather than banks or financial institutions, according to fresh data from a large-scale nationally representative survey. The ‘Household Survey on India’s Citizen Environment & Consumer Economy’ (ICE 360° survey) conducted this year shows that 27% Indian households have at least one outstanding loan. Fourteen percent households have informal loans, 12% have formal loans, and 2% have both formal and informal loans. The ICE 360° survey 2016, covering 61,000 households is among the largest consumer economy surveys in the country. The response period of the survey was April 2015 to March 2016. The survey shows that 30% households in rural India are indebted while the comparative figure for urban India is 21%. These figures are similar to the figures reported by a 2013 household debt survey conducted by the National Sample Survey Office (NSSO), which showed that 31.4% of households in rural India and 22.4% of households in urban India are indebted. The incidence of indebtedness does not vary much across income classes but the size and sources of loans (formal versus informal) do vary greatly across income classes. The proportion of households in the bottom quintile which has informal loans (21%) is twice that of the proportion of households which has formal loans. In stark contrast, the proportion of households in the top percentile which has informal loans (3%) is one-sixth the proportion of households which has formal loans. The quantum of loan varies sharply across income classes and geographies. Most high-value loans are taken by households from the top percentile, and those living in metros. The median loan amount outstanding as on date of survey) for the top percentile was Rs2,14,000 while that for the bottom quintile is much lower at Rs30,000. It is worth noting though that the distribution of assets is also skewed across income classes, and hence the debt-asset ratio of the poorer income classes is far higher than that of the top income classes. The NSSO debt report cited above, which provides decile wise distribution of assets and debt, shows that the top decile (in terms of household asset holdings) in rural India has a debt-asset ratio of 2 whereas the debt-asset ratio of the bottom decile is as high as 38.71. The gap between the debt-asset ratio of the poorest and richest deciles in urban India is wider than that in rural India. 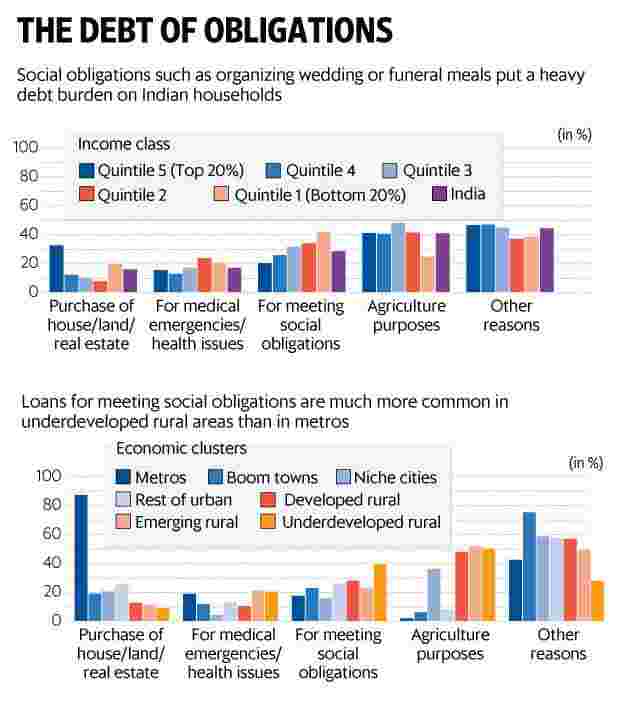 The ICE 360° survey shows that social obligations such as arranging for wedding feasts or other family functions puts a heavy debt burden on Indian households. Nearly a third of those having loans reported taking loans to meet social obligations. The proportion of such households is higher at the bottom of the pyramid than at the top. Among the bottom quintile, 42% indebted households reported taking loans to meet social obligations while among the top percentile, 16% indebted households took loans for such purposes. A notable feature of the ICE 360° survey is that it is representative at the level of economic clusters. Urban India has been divided into four clusters: metros (population more than 5 million), boom towns (2.5 to 5 million), niche cities (1 to 2.5 million) and other urban towns (less than 1 million). Based on a district development index, rural India has been subdivided into three different clusters: ‘developed rural’, ‘emerging rural’, and ‘under-developed rural’. The first category includes districts such as Bathinda (Punjab) and Kangra (Himachal Pradesh). The second category includes districts such as Latur (Maharashtra) and Kamrup (Assam) while the last category includes districts such as Kalahandi (Odisha) and Bastar (Chhattisgarh). The survey shows that the proportion of indebted households in underdeveloped rural areas at 33% is 12 percentage points higher than in metros. Surprisingly, the ratio of households taking informal loans in metros at 13% is nearly double that of households taking formal loans. In contrast, the ratio of households taking informal loans in underdeveloped rural areas at 18% is only 4 percentage points higher than the ratio of households taking formal loans. 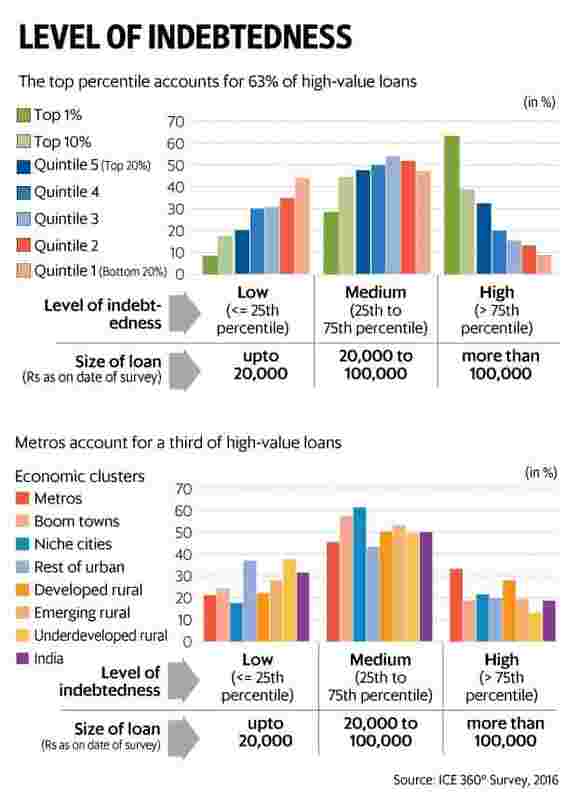 Loans for meeting social obligations are more common in under-developed rural areas than in metros, the survey shows. Forty percent of indebted households in under-developed rural areas reported taking loans to meet social obligations while in metros 17% indebted households took loans for such purposes. The ICE 360° survey was conducted by the independent not-for-profit organization, People Research on India’s Consumer Economy (PRICE), headed by two of India’s best known consumer economy experts, Rama Bijapurkar and Rajesh Shukla. The urban sample of the survey is comparable to that of the National Sample Survey Office (NSSO) consumer expenditure survey conducted in 2011-12. While the NSSO surveyed 101,651 households, of which 41,968 (41.3%) were urban households, the ICE 360° survey covered 61,000 households, of which 36,000 (59%) are urban households. The rural sample of the ICE 360° survey is less than half of the NSSO sample. Nonetheless, all the estimates of each region have been derived by adjusting for the respective population of those regions. This is the twelfth of a 16-part data journalism series on how India lives, thinks, earns and spends, based on the latest results from the ICE 360° survey (www.ice360.in/) conducted by the People Research on India’s Consumer Economy (PRICE) in 2016. The next part will look at how Indian households deal with health shocks.